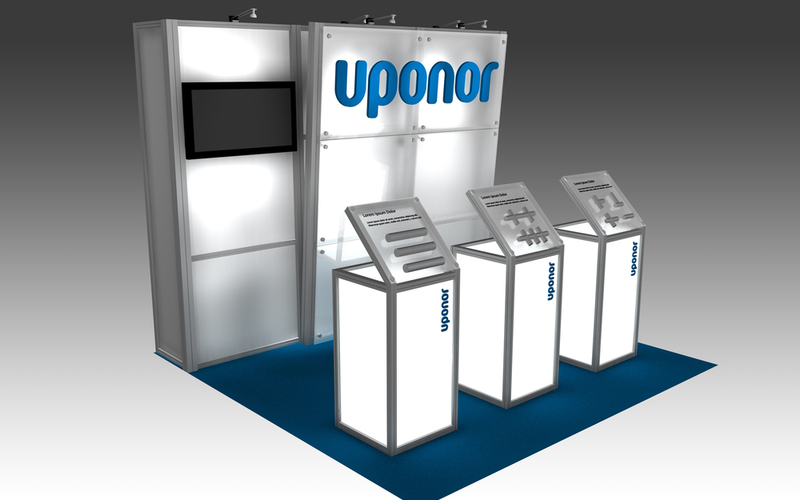 Uponor Case Study — Exhibit Solutions Inc.
Uponor is a leader in plumbing and heating systems worldwide. They are known for their superior product quality, which had to be highlighted in their new exhibit. They wanted a 10' x 20' booth that gave them style, flexibility and, of course, an innovative way to showcase their products. They also required clear messaging that emphasized brand and product recognition. Flexibility was equally important, as the booth size could change from 10' x 10' to a 10' x 20' with each show, and display different products. We used frosted acrylic panels and creative lighting to create a bold statement with a clear central focus on the brand. 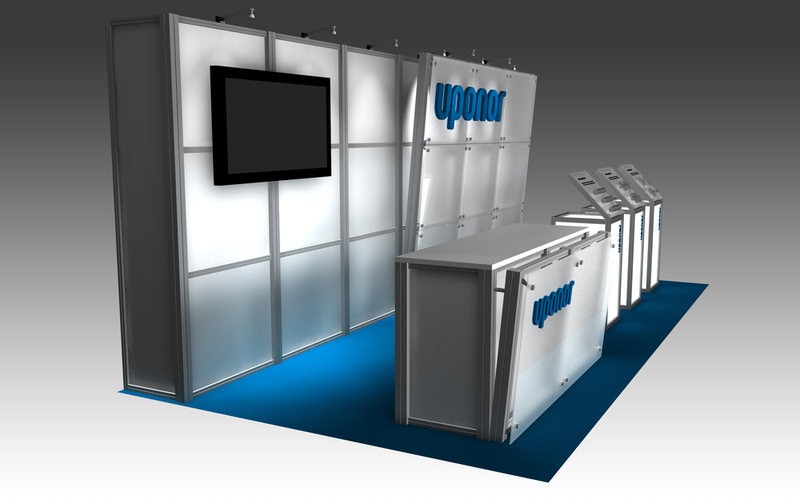 The modular exhibit system gave them the flexibility to easily configure their exhibit from a 10' x 10' to a 10' x 20'. We designed the tops of the glowing podiums so they could easily change their product displays. Their new booth gave them the strong presence they were looking for and helped expand their reach in Canada. With new products hitting the market, the flexibility of the exhibit makes it easy to update their product podiums for subsequent shows. Using frosted acrylic panels and innovative lighting, we created a bold statement with a clear brand focus. Our custom displays with interchangeable panels highlighted the brand and showcased the different products in both exhibit and showroom settings.